The famous Dwarkadhish Temple is located in the pilgrim district of Dwarka. The temple is dedicated to Hindu God Krishna and is also known as the Jagat Mandir. The Dwarkadhish Temple has two entrances on the north and south called the Moksha Dwar and SwargaDwar respectively. The various Aartis and Poojas that are done on a timely basis are very spiritual to watch. The temple structure is also a very important feature with its giant pillars and the 56 steps that leads to the Gomti River Banks on the face of the Arabian Sea. 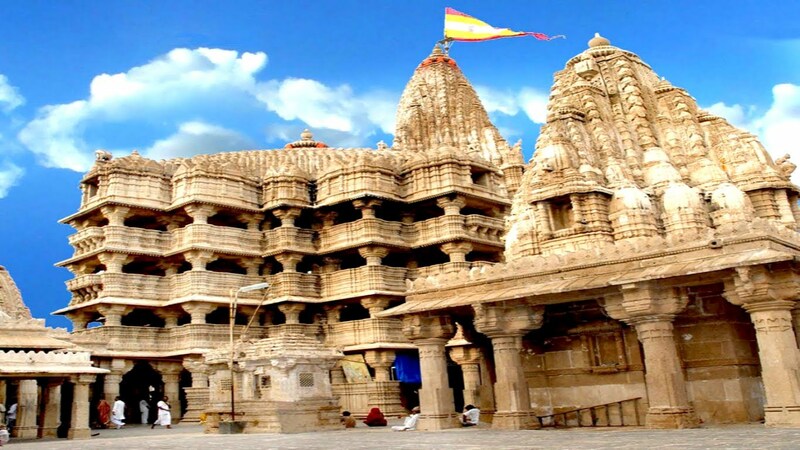 The Dwarkadhish Temple is a must visit tourist location in Gujarat worth a memorable trip.The temple receives great patrons of religious disciples and one can surely get allured by the grand reception around. It has a flag at the top which shows both the sun and the moon. The flag gets changed 5 times every day having the same symbol. The main temple is hugely built with 72 pillars supporting it. The stories about the templedates back to the period of Mahabharata and is situated on the banks of Gomti. It is believed that the original temple had been constructed by Vajranbh who was great grandson of Krishna at the same place where Krishna used to reside. As per archeological findings the temple dates back about 2200 years ago and was enlarged during the 15th to 16th century. The main structure of the temple is close to 5 story which is called the Nirja Mandir. The Dwarkadhish Temple receives great footfall for its religious values associated to the teachings of Shree Vallabhacharya and Shree Vitheleshnathji for its Pushtimarg history. The temple is constructed using limestone which are still in the best of their conditions. The entire temple bestows sculptural detailing that has been carried out by successive dynasties that have been ruling the area. 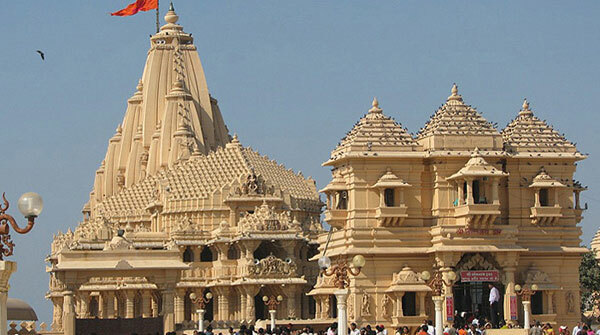 The major town of Dwarka is well connected to all parts of Gujarat which is an important western state of India. The town falls on the interstate highway that connects it to Jamnagar. Buses can be availed from Jamnagar and Ahmedabad every hour to reach Dwarka. Rajkot is 217 kilometers away from it and Jamnagar is the closest at a distance of 137 kilometers while Ahmedabad is about 471 kilometers away. This location can be reached anytime of the year. Several religious rituals are done daily to pay homage to Lord Krishna and the proceedings are a grand affair. Janmashtami is a very important festival to be a part of as it is the birth day of Lord Krishna.